I’ve already blogged about my favorite work of fiction that I’ve read in 2015, but this is the best work of fiction I’ve read this year. By that I mean, while this isn’t the book that I enjoyed the most while I was reading it, it was the most well executed fiction piece that I’ve stumbled across this year. 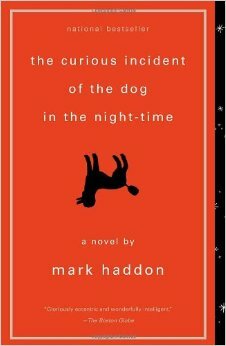 The Curious Incident of the Dog in the Night-Time by Mark Haddon is a book that’s “written” by the narrator, a 15-year-old boy named Christopher who, while not explicitly stated, likely has a condition that falls along the autism spectrum. Christopher’s “book” documents a crime that happens in his neighborhood and his attempts to solve the crime, similarly to the mystery novels, such as Sherlock Holmes, that he enjoys. While Christopher documents what’s happening around him, the author brilliantly depicts how Christopher interacts with the world and some of the difficulties that he has as someone who functions differently than those without ASD. One of the most beautifully written parts of the book is when Christopher decides he wants to travel to a different part of town and must take the train and subway to do so, something that he has never done alone before. He, obviously, becomes completely overwhelmed by how crowded and confusing public transportation can be. Haddon captures these complex emotions so brilliantly! You really need to read it to see what I mean. Since I don’t want to give away any of the plot, I’ll leave you with that very bare bones description of what occurs in the book and hope that you trust that it’s something that you should add to your TBR list immediately! While I recommend reading this in print form because there are visuals that enhance the story experience to be even more enjoyable, my friend also really enjoyed the audiobook version of this book when he was a child. I can’t imagine how it could exist as wonderfully in audiobook format, but my friend swears by it! Apparently The Curious Incident of the Dog in the Night-Time is one of the few books that manages to truly excel and is extremely memorable across all formats. I’m considering going to see the play adaptation of this book on Broadway. Has anyone seen it performed before? Is it worth seeing for someone who enjoyed the book? I’m thinking I’ll probably go with my aforementioned friend who loved the audiobook. Publication Date: May 2003 by Doubleday Publishing. This entry was posted in fiction, Review and tagged book blog, book blogger, book review, doubleday, doubleday publishing, fiction, mark haddon, reading, the curious incident of the dog in the night-time on June 8, 2015 by Bri with a book blog.